As refreshing as it is to see the character of Lady Marion evolve from traditional Robin Hood adaptations which found her held captive as a damsel in distress to becoming a mighty warrior in TNT’s 1997 reimagining of the beloved legend, Tom Kuhn, Fred Weintraub and Sandra Weintraub’s misguided series The New Adventures of Robin Hood fails to hold one’s interest for more than a few episodes. While it does enlist the genre staples of lush wooded scenery (with Lithuania doubling for England), witty banter filled dialogue, plenty of swordplay, and an appealing cast of characters including Little John and Friar Tuck who’ve forged their own makeshift family alongside Robin and Marian, by infusing the series with magic and fantastical creatures, the spirit of Robin Hood becomes muddled with other retellings of famous English heroes and scenarios from Merlin to Avalon and more. 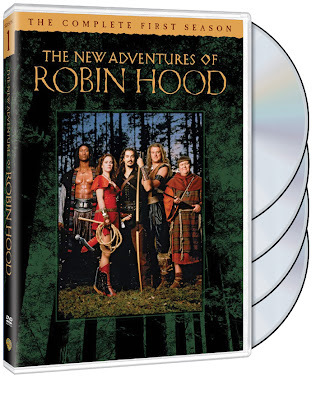 Tying in with the recent theatrical bow of Ridley Scott’s Robin Hood starring Russell Crowe, this four-disc DVD set containing all thirteen originally broadcast episodes and zero extra features including a lack of subtitles comes as an exclusively released slim-packaged effort from Warner Brothers’ online studio shop. As purists are sure to nearly break their remote controls pushing eject violently as soon as the Vikings arrive and shout about “the power of thunder,” New Adventures is perhaps best appreciated by tweens or those who don’t have much experience with the folklore and will therefore not be as disappointed with the wild directions this series takes towards the supernatural realm. And while the structure leaves much to be desired, thankfully the show boasts a terrific cast including a crackerjack lead in the handsome and winningly witty Matthew Porretta as Robin (who ironically appeared in Mel Brooks’ Men in Tights spoof a few years earlier), a spirited Anna Galvin as essentially this show’s interpretation of Marion as Xena: Warrior Princess, as well as Martyn Ellis and Richard Ashton rounding out the quartet as Friar Tuck and Little John respectively. And although the tyrannical tax-obsessed Prince John (Andrew Bicknell) still primarily remains as the enemy number one that keeps the foursome in Sherwood Forest, The New Adventures of Robin Hood is predominantly filled with standalone adventures that often finds the group battling visiting warriors like the Mongols or mystical beings that fail to hold up as painfully awkward transitions from live action photography to cheesy computer generated effects. Strained by its ever-changing tone and obvious struggle to compete with rival series like Xena and Hercules, Robin Hood is somewhat salvaged by its snappy pace, dominance on highly-charged and very modern styled action which feels especially natural considering the fact that the series originally aired right after TNT’s Monday night wrestling. While it does use a pretty simplistic framing device of Robin being knocked on the noggin to set up the extended flashback, it nonetheless shares with us how this incarnation of Robin Hood came to be and in doing so, manages to work in magic on a more natural level that made me wish it would’ve been used as the pilot to help reel the series in and set the tone for the series it aspired to become.